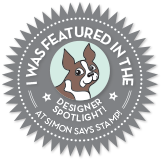 Hello All and welcome to this weeks edition of Simon Says Stamp Monday Challenge: Artist Trading Card. It has been a fun filled but crazy couple of weeks. Got to go to a couple of stamp conventions, and came home with lots of new stuff to play with. So I thought I would break some of it out for the challenge. Hope you all enjoy, cause I had a blast!! I started with a scrap of gray card stock. I used Tim Holtz Distress Oxides, Broken China, Frayed Burlap, and Iced Spruce. Inked up my craft sheet, sprayed it with water and started working my colors. Once I liked it I dried it thoroughly. Then I used an Elizabeth Craft Design peel off dog sticker and put it down over the spot I wanted the dog to be. I then cut two pieces of black metallic cardstock 2.5 x 3.5. I then used an Elizabeth Craft design dog paw stencil with some natural sand texture paste. After hours of waiting for the paste to dry I was finally able to tear off two edges, making sure to tear in the direction that would lead the white from the middle showing. Then I was getting ready to assemble it when I realized I wanted to do a little more with the dog so I took my Sharpie pen and just traced inside the sticker line, and colored in his nose and eyes. From there I layered the torn card stock piece with the paw prints onto the plain piece, used foam mounting tape to attach the dog where I wanted, then punched a hole and found a matching blue brad to hang the small metal happy tag. It's wonderful!!! I really love how the black brought out the puppy design and the paste worked great for the paw prints!!! !